hat is the purpose of an Avatar? How do we move from Form to Formless? These are some of the potent and thought-provoking topics that Sai Giridhar of the Sri Sathya Sai Institute of Higher Learning dwelt on at the concluding session of the colloquium 'Experiencing the Divine – The Form to the Formless' held on the occasion of Sri Sathya Sai Aradhana Mahotsavam at Prasanthi Nilayam, April 23-25, 2012. After rounding up his Masters degree at the University, Sai Giridhar returned to his alma mater, guided by Bhagawan to pursue a doctoral research programme in Chemistry. For many a decade his family has been visiting Prasanthi Nilayam and his memories of Bhagawan date back to his days of a pre-schooler when he was fortunate to have had two important ceremonies - aksharabhyasa (initiation into education) and upanayanam (sacred thread ceremony) performed by Bhagawan. Sai Giridhar is a native of Chennai. In addition to pursuing his academic career, Sai Giridhar has taken up the role of a mentor in the Sri Sathya Sai Hostel and is also the Cultural Co-ordinator. Presented below is the transcript of the talk he delivered in Sai Kulwant Hall on the evening of April 25, 2012. The One who is capable of making the mute speak, the One who is capable of commanding the lame to cross the Himalayan range, the very thought of Whom fills us with paramananda (supreme transcendental bliss) to that Lord of Lords, my most beloved Bhagawan, my humble salutations. To all the wonderful sparks of divinity, a loving Sai Ram to all of you. In the given time today we shall deliberate on a few questions. What is the purpose of an Avatar? When we say that we have to move from Form to Formless whose Form are we talking about? What is the Form of God and how do we make this transition from Form to Formless. The first question is what is the purpose of Avatar? When couple of our professors discussed this very same question, they got a doubt. Rama Avatar came in Treta Yuga. But we see that in the Dwapara yuga that followed it, dharma apparently declined. After Dwapara Yuga when Lord Krishna left His mortal coil Kali Yuga followed and again dharma declined. But the Lord Himself has said that when there is decline in dharma I shall manifest again and again! Then what is the dharma which the Lord has come to establish? If Lord Sri Rama wouldn’t have taken Avatar, would we have had a Tyagaraja who would inspire millions to follow his path of love to God? If Lord Krishna wouldn’t have manifested in that most beautiful form would Mother Meerabai and Shri Ramanujacharya ever be able to spread their message of love for God thousands of years later? If Jesus wouldn’t have appeared to speak about the glory of His Master and His Father would there be millions of followers of Jesus who have installed love and compassion in their hearts now? The purpose of the Avatar is not merely to show man how to lead an ideal life, to set up marvelous models and institutions like the Super Speciality Hospital, the educational institutions and so on. Agreed they are all marvelous models for humans to emulate but the purpose of the Avatar is much beyond - it is to bring the transformation of the heart. The Avatar that we are talking about today is our most beloved Bhagawan; it is impossible even if all the minds in the entire cosmos come together to comprehend what He is. It is only possible if He tells us, if He reveals the secret of His Avatar to us and He did so through a story. Once a devotee asked Bhagawan: “Swami, what is Tripura Rahasyam?” Bhagawan smiled and said, “Let me tell you a story.” He continued, “Brahma, Vishnu and Maheshwara once had a doubt. Now if we have a doubt we can go to our teacher, if great Masters have a doubt they approach Brahma, Vishnu, Maheshwara but if these Lords themselves have a doubt whom will they approach? Brahma, Vishnu and Maheshwara approach the Shakti or Tripura Devi who created them, the Shakti that manifested them. Mother Tripura Devi humbly submitted and said, "Even I do not have answers to your questions". Swami then said, “On the both sides of the hallway there were thousands of thrones and the four legs of the thrones were Brahma, Vishnu, Maheshwara and Tripura Devi. These three Gods who had this doubt in their mind were stunned to see thousands of Brahma, Vishnu, Maheshwaras and Tripura Devis. They thought they were alone but then they were more inquisitive to see whom were they prostrating to. At the end of the hallway they saw a beautiful Lotus Feet and when they craned their neck to see who that personality was, they saw Bhagawan Sri Sathya Sai Baba. Bhagawan Sri Sathya Sai Baba is a Cosmic Avatar, He is the Adi Purusha who manifested Himself to become Shakti and that Shakti in turn manifested into many Tripura Devi’s and each one initiated a creation. Even science recognizes today that there could be several universes in parallel. There are many Brahmandas (universes) and the Adi Purusha (Primordial Being) who manifested the Adi Shakti to initiate creation, the Power who willed to manifest into many Brahmandas Itself came here on this beautiful Earth as a Cosmic Visitor.” Such is the beautiful Form of the Lord. Bhagawan says: “The Form of an Avatar is nothing but the concretization of the penance of love and sacrifice of the devotees.” He appears to us as we want to see Him; He is the concretization of our love, our penance. Now the question comes - how can I ask a devotee to relinquish such a beautiful Form of the Lord? 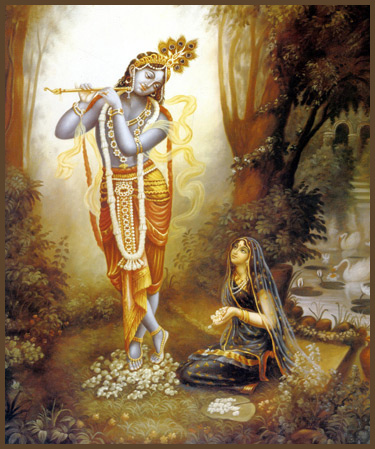 How can I ask a devotee to give up such a lovable Form of our Lord? In interviews which Bhagawan gave, we all know how beautifully He would set an example for all of us. He would open the door, call everybody inside, allow everybody to go in and only then would Himself go in. And then He would turn on the fan, close the door behind, come and take His seat, and finally begin talking. A perfect host He was! Bhagawan once narrated a beautiful story of Mother Radha and Krishna. Once Krishna returns to Brindavan after the Kurukshetra war and he goes to the banks of Yamuna in search of Radha and He sees that she is seated under a tree lost in her thoughts. So Krishna thought that He would surprise her; He slowly walks around the tree and suddenly jumps in front of Mother Radha, expecting that she would jump in joy and surprise. But to His utter dismay Mother Radha looked at Him and gave a smile. At this point, Bhagawan says - it is a grand secret dear brothers and sisters - the Avatar for the first time fell on His knees, held Mother Radha’s hand and said, “Radhe, it is for the first time in My entire creation that I have received something from My devotee - unconditional love.” Bhagawan says this unconditional love is what will help us connect to Him. How do we move from the Form to the Formless? What is the message in this story? When Bhagawan said 'Don’t run around this physical body' He wanted us to understand that the physical body is made of five elements and by His own divine design these five elements have to merge back into their source. But His form, His most beautiful Form, is not to be given up, it is to be enshrined by every devotee in their heart and the reflection of this is to be seen in the mind’s eye. And His most sacred and powerful name is to be integrated in our every breath, in our every activity till our very last moment. To move from Form to Formless is to enshrine His beautiful Form in our hearts. “The yard stick to measure devotion of a devotee,” Swami says, “is to see the shanthi of a devotee.” Only that will determine how much devotion a devotee has.” So the measurement of how much devotion we have for the Lord, or how much love we have for Bhagawan, is determined by how equanimous we can be in the face of duality. Here I would like to narrate an extraordinary incident which happened last December. There was a gentleman who came from Indonesia. He is a devout Muslim. His guru Radeen Saheed was a Sufi saint who lived in the 15th century. He used to practice the teachings of his guru and the name that resounded in his heart and mind was ‘Allah ho Akbar’. An extraordinary experience this gentleman from Indonesia had, but what a profound message Bhagawan was giving us, ‘Call Me by any name I will be there for you’. Sarva Roopa Dharmam Shantam - So what is His true Form then? Sat Chita Ananda Roopam Advaitam. Swami says: “Please understand I am only One.” This whole drama of life and creation is a monoact. And how wonderfully He is playing His roles! What variety, emotions, and grandeur this creation has and every single role in this entire universe is played by only One and One alone! And He says: “My true Form is Sat Chit Ananda.” Sat means truth, that which does not change with time. The next interesting word for us is ananda, how will we experience ananda or bliss? The secret is the word in between chit. Chit means awareness. But awareness of what? 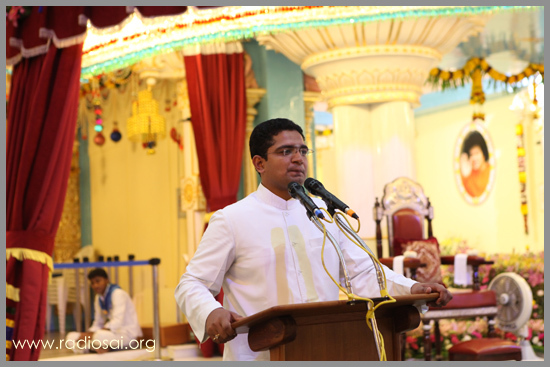 Mr. Sai Giridhar speaking on the concluding day of Sri Sathya Sai Aradhana Mahotsavam at Prasanthi Nilayam, April 25, 2012. Sureshwara Acharya, one of the prime disciples of Sri Adi Shankara, formally known as Mandana Mishra, wrote a beautiful treatise called 'Naish Karmya Siddhi', after he understood in depth what advaita (non-dualistic philosophy) meant. In his writing, he gives us the secret of awareness. Chit, which is awareness, is the link between sat and ananda. Now, ananda or bliss is a manifestation of sat (truth). But how do I manifest truth (sat) in the form of ananda and awareness? He explains this in a simple way. He says when you are walking on the road you see a stone. Now the object is there and you see it too. But if you are not thinking about it, then you will trip over the stone and fall. But if you see the stone and immediately have thoughts associated with the stone, you become aware of the stone and then walk around it. Chances are that you might even pick it up and put it aside so that nobody else gets hurt accidentally. Sureshwara Acharya says that the secret to awareness is the object and the thoughts associated with objects. God, Brahman, Atman, or Bhagawan Sri Sathya Sai Baba is omnipresent, the object of awareness is present everywhere. He pervades the entire cosmos, every single atom of it. For us to become aware of His presence in our life, for us to become aware of His presence in every single atom in this world, we have to have ‘smarana’ that is, thoughts associated with Him. We have to constantly think of Bhagawan. This is a secret also revealed by Prahlada. What did he do? He constantly thought of Lord Narayana. So when troubles came by, all he did was intensely pray and Lord Narayana Himself was there! So, the secret to awareness, the key to manifestation of truth or Sathya is thinking about the Lord constantly. But Swami did not stop with this. After Sarva Roopa Dharam Shantam, Sarva Naama Dharam Shivam, and Sat Chit Ananda Roopa Advaitam. He went on to say Sathyam Shivam Sundaram - the three ways in which the Divinity is recognized. What is the correlation with His true Form of Sat Chit Ananda? Sat or truth, the non-changing entity is Sathyam, which is none other than Sathya Sai Himself. Now if Sathyam has to manifest in the beautiful form of Sundaram in our lives, what is required is Shivam. So, we should cultivate auspicious thoughts, and participate in auspicious activities with constant contemplation of the Lord. To conclude I want to submit a prayer which I made to Bhagawan and the answer which I got for it. It is only later I realized that what I was asking for and what the Lord Himself was telling me was one and the same. If we allow the Lord to see through us, we will see nothing but Himself. For when the Lord saw us He did not see us as separate from Him. He saw us as Himself! So if He sees through us, all that we see will be Bhagawan Himself. If He speaks through us, who is the first person to listen to Him? The first hearing instrument closest to my mouth is my own ear. So when Lord speaks through me I will listen to His golden nectarine sweet voice. With this prayer that Bhagawan should see through all of us, speak through all of us, live through all of us and love through all of us, I seek His permission to conclude today’s talk.